United States Army Col. Tom Collins is the outgoing spokesperson for the NATO-led International Security Assistance Force (ISAF). He is a former spokesperson for the U.S. Coalition Forces in Afghanistan. The interview took place April 2, 2007, at the ISAF headquarters in Kabul. Q: Roya Aziz: In your last press conference you described the Taliban as fetid water and that they establish a presence where there is no government presence. Can you expand on that? 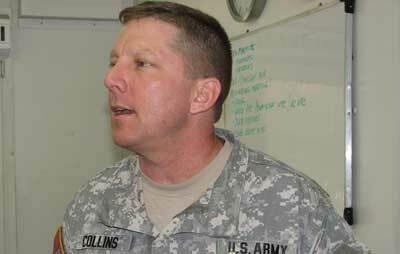 A: Col. Tom Collins: I would just start off by saying that the Taliban are very cruel people. Their actions frequently demonstrate the extreme measures they are willing to take to get their way. The incident in Musa Qala is a perfect example back in February. They couldn't get what they wanted from the elders who basically run the community so they chose to overrun that city, that town and basically impose their will on the people and we see that occurring in other places in the south and it's because the government really doesn't have the forces to protect the people in those areas. The Taliban go where they can have their way and as you know they bring an extreme form of ideology that survey after survey has shown is not supported by the majority of the people, but again they impose their will on people. Q: According to the ISAF view now, or NATO view, who are the Taliban? Who are these people picking up weapons? A: Well it's a very mixed bag. There is a low percentage of the total Taliban force who we would call ideologically driven. We refer to them as Tier 1 people who believe their ideology, that what they're doing is right. The vast majority of Taliban fighters are essentially economically disadvantaged young men who don't have any other opportunities and they chose to fight for the Taliban because the Taliban pay. There are also those who are involved in narco-trafficking who are not necessarily part of the Taliban but they have a criminal relationship with them and they help each other so that's also part of the equation. But it's not just the Taliban that are a problem in this country. In the north and west you have some criminal activity. Those areas are largely stable but we do see some criminal activities associated with narco-trafficking. In the east you have the Haqqani network and the Hizb Islami network, which again are primarily criminal networks but they form a symbiotic relationship with the Taliban because they are all anti-government, anti-Western forces. Q: There's been a lot of hype and press about a so-called spring offensive. A lot of that seems to be based on Taliban propaganda, counter-propaganda. What is this supposed spring offensive? A: The Taliban have a pretty effective propaganda machine and they are able to throw out a lot of information in an effort to scare the people. We do see evidence that the Taliban are going to slowly ramp up operations as the weather improves. We don't expect to see the large pitched conventional battles like we saw last summer. The Taliban were dealt very decisive blows, but what we do expect to see this year is a gradual increase in the number of suicide bombings, car bombings, things of that nature in an effort to demonstrate that the government is unable to protect the people. Now obviously that's true in some areas, but for the most part the government is making progress and is able to provide for better security. Nonetheless, the Taliban is in a critical year. Last year they tried to derail NATO's deployment (to the south) and clearly they failed, but what they're hoping to do is to reduce the international commitment here in Afghanistan and convince the people you know, when the international forces are unable to protect you you'll have to rely on us. The goal here really is to prove that we can provide certain standards of living, that the government is operating in the best interests of the people so it really is a long-term effort. Q: Do you think that message is getting across to people, especially in places like Kandahar where people feel very much that they are stuck between a government that can't protect them, international forces that are supposed to be protecting them but then bomb them, and the Taliban who came and occupied their villages? A: It's really a battle for the hearts and minds of the people and we understand the immense challenges that we face but we also sincerely believe we are making progress here. One of your problems here is the remoteness of many of these communities and the lack of literacy. People in large part are dependent on word of mouth and the Taliban unfortunately is pretty effective at creating rumors and essentially lying about what the international military forces are trying to accomplish here, so we have to deal with that. Nonetheless, we understand we have to demonstrate progress. If you look at what Operation Medusa did last summer in Kandahar -- a kinetic operation quickly followed up with reconstruction -- but now we are really starting to see the effect of that reconstruction. You are seeing roads, wells, clinics, things of that nature being built in Panjwayi that are now occurring you know four, sometimes five or six months after the operation itself. What we hope to do is kind of compress that time so we can follow operations more closely with the reconstruction to demonstrate to the people that "here, this is what it's worth." Q: What is going on in Kandahar because a lot of the focus now seems to be on Helmand -- Sangin, Nau Zad, Musa Qala and the Kajaki areas? Just a few months ago we saw intense bombing (in Kandahar). A lot of people displaced. The current operation [Baaz Tsuka] that was launched back in December, that's still ongoing, but what does it entail? In the beginning of that operation we saw some air strikes. It did not look like just a reconstruction mission -- you were still engaging the Taliban. A: We're still continuing with operation Baaz Tsuka, which was a reconstruction focused operation in the aftermath of Operation Medusa that pushed very large numbers of Taliban fighters out of Kandahar province. We still see some evidence of the Taliban trying to reestablish their presence in the areas west of Kandahar and that's where we are focusing a lot of our reconstruction effort right now. We are building roads through those areas. We are continuing with development of wells and health clinics pretty much focused on improving the lives of people in Zharey and Panjwayi districts. But again that's a long-term effort and we have to show progress right now, which is what this effort is focused on. And as I said before, we know the Taliban is trying to come back there so to have a permanent presence there -- that this is worth fighting for -- we have to provide material improvements to their lives. Q: Can you be a bit more specific about the projects there, and how much extra police there is or army or NATO down there? A: If you know Highway One, the main Ring Road for this whole country goes right through Kandahar and moves west up to Herat. We are in the process now of trying to improve that road and basically repave certain parts of it and that's an effort being led by Japanese donations right now but we're in the integral part of providing security around that area. At the village level, a lot of these people they don't have paved roads, they don't have simple things like clean drinking water or irrigation systems, so we are focused on small-scale projects, micro-hydro electric projects, digging wells in these local communities, providing basic buildings that can be used for schools, health clinics, meetings, mosques in some case, but it's very much focused at the local level. By Western standards you probably wouldn't think these are very great projects, but to the people they are building on areas where they have nothing right now. They haven't had anything in decades because of three decades of civil war. As far as the police and Afghan army, they are still very much in the process of growing right now. The Afghan army is a little over halfway of where it's going to be at the end of 2008. The police continue to grow in strength and capability, but we still don't have all the forces we need to establish a permanent presence. When Coalition or ISAF forces move through areas, the goal is to make sure that we have well-integrated Afghan forces in those formations and then they provide the permanent presence because it's really that connection, the Afghan connection between the army, the police and the people of this country that is the permanent presence. Q: To date though, in the areas that the Taliban had occupied and where you saw severe engagements last summer and fall, in those areas a lot of people said: We see the district mayor, sometimes maybe we'll see the governor and we ISAF come through here, but at night it's a completely different ball game. So is there a consistent presence now or is it again one situation during the day you have visitors coming, and then the people are left to themselves again? A: Certainly in some places we have been able to maintain a permanent presence, but to be quite honest, it's spotty. In some areas we are not able to maintain that and the enemy exploits that. People have to realize though how incredible the challenge is here in Afghanistan. This country in many places has no infrastructure. Through three decades of civil war, it lost what it had and we're starting from scratch in many areas. You can go to Panjwayi today and you see mud huts, no roads, no running water, no sanitation and that's how it's been for years and years now. So we're trying to improve from a really really low baseline. Q: NATO in that sense is caught in this cat and mouse game. You catch them, and then you leave and you try to provide some protection, but again, don't you feel you're caught in a cycle and how do you break out of that cycle? A: Well we understand that this is a long-term proposition. We're talking years if not decades. It's not going to be solved here in the next year or two years. And you're right. The enemy gets to vote in a lot of cases and where we move against them they choose to back up and move into new areas. The real solution here is not more international military forces. The solution is more army, more police and more other institutions of the Afghan state. I mean we fundamentally believe if the people start to see progress then they will choose to defend these areas themselves, to not give sanctuary to Taliban extremists or narco-traffickers. We have a long-term effort here that's focused on reconstruction and development. Yes, we have to conduct security operations in certain areas but we also know it's going to take years and it's going to take commitment and patience on behalf of the international community and the people here. Q: People don't have a choice. Their hands are tied. Somebody with guns comes to your village and says, please welcome us, what are you going to do? How can these villagers defend themselves? A: Well we see evidence that villages are defending themselves. If you look at Khost province and Kunar province where there has frankly been a lot of development and there is a higher density of international military forces. In those areas we've seen specific cases where the people have chosen to defend their areas, to push out the extremists who are trying to move into their areas because they value the development and what their government and the international military forces -- they value that far more than what the Taliban or other extremists can offer. We hope to see that replicated in other parts of the country. Again, it's going to take time. Q: Is there a fear that during that time where you build up the army and the infrastructure improves, that the Afghan people are just going to get tired of this cycle? And if things continue as they have been for the last year and a half, where you had these engagements, the civilian population only gets caught up in this? A: We recognize that there are setbacks here and there, but overall we see that the ball is genuinely moving forward. Sometimes it's small steps, but it is moving forward. If you look at the progress in this country. I mean under the Taliban there were one million kids in school and every one of them was a boy. Today we have over six million kids in school and two million are girls. You have a constitution that's probably the best in all of Central Asia; you have a democratically elected parliament and president. There are many signs of progress here. The issue here is how do you translate that to the average Afghan on the street? What does it mean to him? And that's where the real challenge is. But we continue to make progress. There's a lot of money coming in to this country to stand up programs, but again when you look at how low the baseline was, that gives you a sense of how far we've come, but it also gives you a sense of how far we have to go. Q: Is there a plan to change the strategy so you don't get caught up the way you were in Kandahar last summer? Is it going to be the same strategy -- aerial bombings and engaging "the enemy" directly? A: I don't really accept the thought that we need to change our strategy. We have a fundamental strategy here that's based on a long-term effort. We use close air support very judiciously. I mean we certainly don't use it indiscriminately. The Taliban have a very bad habit of choosing to fight among civilians in an effort to protect their own operations. And unfortunately civilians have been killed, and every time that happens it's a tragedy that reflects badly on the international military forces. We certainly are very conscious of that and we work with people now to try to minimize that but we also know it's going to continue to happen and hopefully in very isolated cases. But for the people of Afghanistan, I don't think the Taliban are really a choice. If you look at all the independent surveys that have been done -- not by the military but truly independent international organizations -- there's a very low level of support for the Taliban, somewhere between 10 and 15 percent. The support for international military forces is above 70 percent -- consistently. So I think the people have made a choice. There's no doubt that they may run out of patience. We have to continue to work that very hard and remain conscious of it and to try to again bring these fundamental improvements to these small villages. We're never going to get to every valley or village in this country but we are focused on the major areas where we think we can make improvements. Q: And those improvements are coming through the form of provincial reconstruction teams. How many are there and how many of the total ISAF troops are involved in that type of reconstruction work. A: There are 25 PRTs [Provincial Reconstruction Teams] currently. There are plans to get more in this country. Each one is different. Each one has you know, more or less, troops numbering somewhere around 80 to 100, so you're talking anywhere between 2,000 to 2,500 troops devoted to the PRTs. But it's much larger than that. The PRTs are co-located with the governors in each province and they are the central focus point for any kind of international military support in that province, so they have a much greater impact than maybe just what their numbers might show. They really are, I think, the tip of the spear as far as our effort here to provide reconstruction and development. Q: And how much of that PRT work is foundational or institution building versus donations and medical care here and there, versus establishing a clinic or establishing school? A: Well, a lot of it has to do with infrastructure. Roads, clinics, things of that nature, but wherever possible we try to use Afghan labor and build Afghan skills to where they can eventually do this work by themselves. So I would say it's focused in a dual sense of producing things for Afghans, but also giving Afghans the capability to produce those things on their own. And we are involved in things like good governance, in helping to stand up the judicial system in this country. That's an Italian lead across the country, but certainly the PRTs play a role in things of that nature. Q: A lot of people say the PRTs are nothing more than there to give the governors support so that the governors win people's support. There's a benefit for local people, for communities, but clearly there's also a benefit for the military. Why do this PRT work? A: I don't agree with that at all. To me that's a very much a glass is half empty viewpoint. You have to judge the PRTs on what they're able to do on the ground and there's no doubt that they are fundamentally improving the quality of life for Afghans in those areas. It's also clear that we would like to have more PRTs. There's 34 provinces in this country so right now nine do not have PRTs and we would like to see a steady expansion of the PRTs. We've added new ones in Nuristan in the last half year. That's in the northeast part of Afghanistan -- very remote areas, places where people have never seen Westerners and they have no real quality of life. Without that PRT development would not be occurring in Nuristan. They are performing a very critical mission and you can throw darts at them and say they could do their job better but the bottom line is that they are doing very well in what they are tasked to do. Q: What do you think is most misunderstood about the ISAF mission or the NATO mission here, whether it's generally abroad or even in Afghanistan? A: I think when you get out in the villages of Afghanistan, the most remote parts of this country, they're not really sure what ISAF is about and what it's bringing to this country and it all goes back to a lack of education and not understanding really what we're trying to do. We do not come as conquerors or invaders or as crusaders. I mean we all want to go home to our families some day, but we've come here to help improve this country to where it will never again be a safe haven for international terrorism and to just make it a more stable member of the Central Asian states. And that's really our fundamental job. And again, it's going to take years to get this done, but we have made a lot of progress but we still have a long ways to go. Q: How long will international troops be here? A: Well, ISAF does not have a date on the calendar when we'll be gone. We have an end state. We want to be at a place where the Afghan army and police can provide a level of security to where they can police their own borders and basically provide a safe environment for the people and the economy to really get up and running. I mean I think it's safe to say that is years away and we'll know we're there when the Afghan people say we've got it, we don't need the presence of international forces anymore. And when that happens we'll gladly go back to our homes knowing we did what we came here to do. Q: That sounds like it's decades away though. A: You never know. You think we've been here five years now? It could be longer than that. I don't know but I know we're focused on an end state for Afghanistan not necessarily a date on the calendar.